Building Cars Live – my thoughts – HubNut – celebrating the average! Having recently returned to the world of the TV Licence, I can start watching TV as it is broadcast again. That’s what I did last night, tuning into the 90 minutes of Building Cars Live. 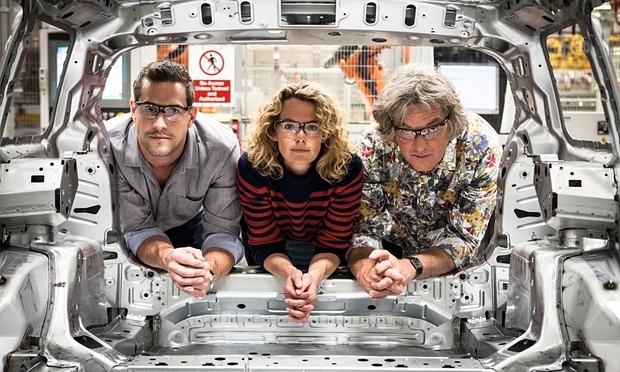 The show consists of live segments, in which James May, Kate Humble and Ant Anstead show different aspects of the BMW Mini ‘Plant Oxford’ site (or Cowley as I still prefer to call it), interspersed with pre-recorded elements. Some telly people tell us about cars. Generally, it’s a very good programme. Sure, some of the live links are a bit messy – especially the one where James May failed to fit a tailgate – but I found it interesting and informative. I must say though, I really can’t stand Kate Humble. She manages to sound very patronising, which I think is because she’s trying to sound knowledgeable about stuff she doesn’t really understand. There was a pre-recorded segment on electric cars for instance where she either managed to act the part of a clueless idiot very well, or she really is a clueless idiot when it comes to EVs. Far better were James May’s visits to Nissan in Sunderland, McLaren in Surrey and Morgan in Malvern, demonstrating that we really do still make things here – and vastly different things too. Ant Anstead had an amusing outing with some original Minis too and, surprisingly, he seemed the most comfortable of the three during the live sections – though May’s oddball sense of humour made his bits fun to watch too. However, the history section was a bit garbled and frankly, wide of the mark. A German designer was seemingly presented as the designer of the new MINI when the truth is, the genesis of the car is very British. And hearing the designer try to claim that the MINI meets the same design objectives as the original was painful indeed. It’s neither as small as possible, nor as simple and economical as possible. It couldn’t be further away from the Issigonis ideal, though I shall avoid the temptation to go on about in-grave acrobatics. He wouldn’t like it though. But, that was a mere trifle really. Yes, it’s sad that a mere 4000 people are employed at Cowley now compared to the dizzy heights of 28,000 decades ago, but that just shows how the industry has moved on. Fantastically clever robots do so much of the work now, and everything is timed to the second. You can bet your life that BMW actually manages to make a profit on its version of the iconic Mini. I shall certainly be watching. Again, well done BBC. You do things differently, which is to be applauded. I really did enjoy it, bit embarrassing for James may and the tailgate but overall a very enjoyable well made live show, and good to know they use welsh steel in production, for now anyway. I agree with your ramblings wholeheartedly. I actually found Ant Ansteads classic car show recently quite good; not the usual fake rows and orchestrated disasters we are used to seeing on car shows and I think he rolled that into yesterdays show. The trouble was that yesterdays show was ‘dumbed down’ to make it palatable for non technically minded people who probably weren’t watching it anyway! I am sorry, I found JM just annoying. Another enjoyable program tonight. You can take Kate Humble for me, but leave Ant, he (hopefully) has a future in presenting (‘cos the knows his spanners). James managed to not cross thread any bolts tonight! Indeed. James (especially not-live) and Ant come across very well. Hilarious that they just drove off without Kate at the end. Selective hearing?